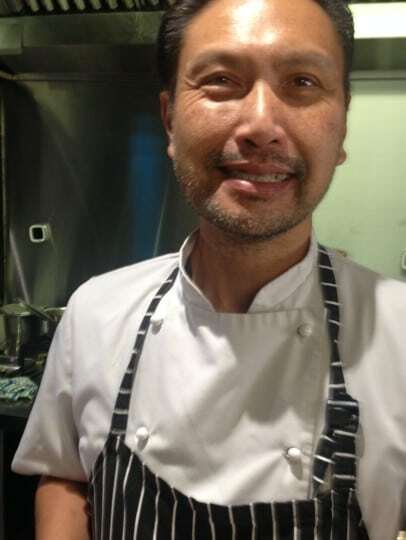 Edmund Hung of South China Dim Sum Bar. Is it excessive to get just a bit lyrical about a winelist with only 14 wines on the list? Maybe not when it’s as well chosen a list – and as appropriate – as that at South China Dim Sum Bar in Cape Town’s Long Street. I suspect many of those coming for Edmund Hung’s delicious range of steamed, fried (especially the “pot-stuck” ones! ), stewed or baked little platefuls will choose tea or beer, but if they are winos they won’t have any problem finding something to enjoy. It’s all been chosen by the chef-owner (who sounds like the true South African he is, and looks and cooks like a Chinese) as suitable for the food, and it speaks of a proper acquaintance with what’s available out there. Half of the list is available by the glass. Oh, and it’s reasonably priced. So what’s not to praise? Wine out of tumblers? Only appropriate at South China Dim Sum Bar. There are six listed as whites (though one’s a rosé), six reds and two bubblies. 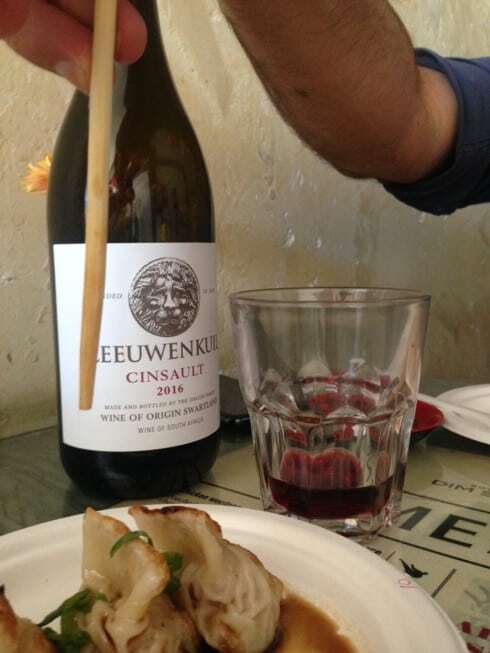 Last week when I went to the restaurant with a friend I frequently meet in town for lunch (for ages it was invariably Chef’s Warehouse, but that marvellous place has become a bit too pricey for frequent visits), we felt like a light red, and there was Leeuwenkuil Cinsault happily waiting at R160. It could have been pinot – either Felicity or Newton Johnson Walker Bay – or, if a bit more weight is wanted, Anura Merlot, or a shiraz from Tamboerskloof, or a cab-shiraz from Waverley Hills. In fact, we usually go for white to accompany our greedy eating when we come here, and I do think white works better with most of the dishes. Last time it was the well-named Stone and Steel Riesling from Oak Valley, and the time before it was the Sutherland Unwooded Chardonnay from Thelema, another clean, bright and fresh wine. Currently, there’s also the basic Joostenberg Chenin (always good value), Beaumont Hope Marguerite for something rather richer and grander (it’s the most expensive stuff on the list, at R375), Trizanne Sauvignon Blanc-Semillon, and Glen Carlou’s Pinot Noir Rosé. The bubblies are from Môreson and Weltevrede. It must be said that my pleasure in the winelist (presented on a single laminated plastic sheet) is inextricably tied in with the total pleasure of eating South China’s delicious offerings in the modest, unpretentious and somehow authentic atmosphere of the front part of the small restaurant, watching Ed in his kitchen prepare our dishes as we order them, with the likes of Bob Dylan not too noisily sounding from the loudspeakers. Would I prefer my wine to be served in a decent wineglass rather than a tumbler as happens here? I surprise myself by being not at all sure. Again, it seems right like it is, and an appropriate part of the whole honest experience. I see I’ve already used that adjective, appropriate, twice, and could have done so a few times more. It’s an important category. Part of integrity. When the smarter, trendier (and also very good) restaurant La Tête serves wine off its more obviously impressive winelist it does so in horrible, thick, small wineglasses that are scarcely a step up from the dreaded Paris goblet (“egg-cups”, David Clark calls them). That’s inappropriate to the atmosphere there, and I dislike and disapprove, and it doesn’t at all enhance the experience. I wouldn’t like those glasses at South China either, frankly, but tumblers – no problem.